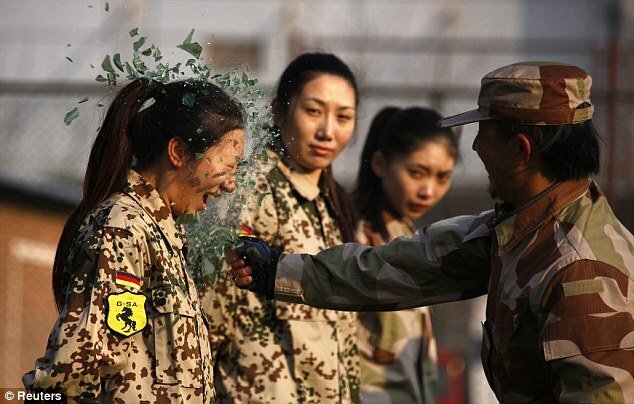 A Chinese recruit has to stand and take a bottle smashed over her head if she wants to qualify as one of country’s first female bodyguards. The female bodyguards training session, which took place in Beijing, involved 20 women, most of whom are university graduates. The four-week programme is run by trainers from Tianjiao Special Guard Consultant Ltd and is the first open group training for female bodyguards in China. Each trainee goes through ten months of instruction to develop her skills in reconnaissance, anti-terrorism training, martial arts and business etiquette. That is especially the case for women, who are in high demand because they are less visible than their male counterparts and because they can assume roles such as secretary or nanny. Female bodyguards are often paid far better than male counterparts – up to $100 a day – because they can adopt these different roles. The average annual wage in China is just $1,500.